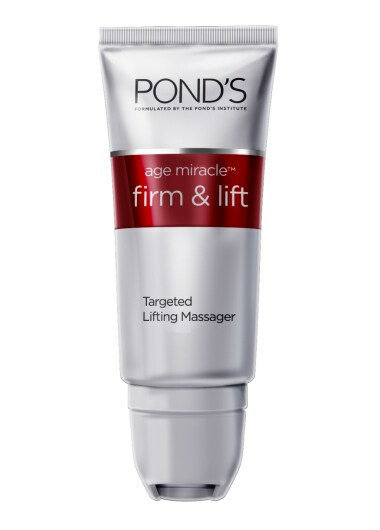 The Pond's Age Miracle Targeted Lifting Firm & Lift Massager is a fast acting treatment that is clinically proven to lift the skin around your Y-Contour. Get visibly younger-looking skin. Lift your Y-Contour by up to 0.40mm while reducing the appearance of fine lines and wrinkles. Pond’s Age Miracle with InstantLift™ Complex strengthens and tightens fibers from inside the layers of your skin to reveal a firmer and lifted skin on the outside. Two potent ingredients, Polyimide and Lipodipeptide, strengthen and tighten fibers from deep within your skin. After cleansing, toning, and exfoliating, apply the serum to your neck, jawline, and under your chin. Massage the serum into your skin with the built-in roll-on applicator, which leaves a cooling effect. You may apply moisturizer once the serum has absorbed into your skin. The New Pond's Age Miracle Firm & Lift Day Cream, with Retinol-C Complex, works 24 hour nonstop to keep your skin looking youthful radiant.